Click HERE to listen to excerpts from some of Peter’s albums. Check out Peter’s VIDEOS page for additional links to some of his original music, or visit his YouTube site. As part of an on-going mission to produce new music scores for un-scored silent films (many of which have been out of circulation and considered missing for almost 100 years), Turner Classic Movies created the Young Film Composers Competition, an annual event with national coverage. Peter was chosen as the 2001 grand prize recipient. As part of the award, Peter was hired to compose the full score for the 1921 classic silent film version of Camille, starring Alla Nazimova and Rudolph Valentino. After the score was completed, Peter recorded the score in California with top calibre LA studio musicians. The premiere aired on Turner Classic Movies on February 14th, 2002 along with four other Valentino films. This 1921 version of Camille with complete score is now available on DVD with the Greta Garbo version. When taking on the job of scoring any film, the composer has a challenging role: enhance the content of the film while not distracting the audience. Scenes that illustrate this dual role often involve underscoring dialog. The composer must relate to the characters so that the music supports the emotions and reactions that evolve during a particular scene. The composer must also be cautious not to pull the audience’s ears away from the dialog. This can happen by using too much melodic information, inappropriate rhythms, or too much instrumentation at one time. In silent film, the challenge is similar except that the music now becomes more important in supporting the film’s content, for now it is the only audio source synchronized to the film. Thus, in a way, the music becomes the dialog. And since there is no other sound source, the music must also keep the listener interested. It’s as if a film and symphony have been meshed together. In writing the score for Camille I took the approach of most film composers. I watched the film many times, developed various themes for different characters and moods, spent time identifying with the characters and the situations presented on screen, and then wrote the music as the film dictated. Of course every composer has a different approach to what sounds appropriate for a particular scene, and often more than one approach works. I wanted to support the story, characters and emotions of the film as best I could while maintaining musical interest. The score is primarily based on just a few themes, and those themes are treated differently depending on the mood. In one instance, I used a portion of the love theme when Marguerite (Alla Nazimova) makes the decision to leave Armand (Rudolph Valentino) in order to preserve his family honor. It is a very tragic and intense moment, yet she conveys her deepest love for Armand. So I set the love theme in a minor key, a more tragic setting to portray her grief and sorrow. The most difficult scenes to score were the party scenes shown early in the film. They were challenging because the music had to portray a sense of frivolity and joy but at the same time reveal the shallowness of the people who attended these parties. I was immediately drawn to jazz elements but did not want the music to become actual jazz tunes. So I incorporated jazz rhythms within the traditional orchestral framework. At the same time I put odd combinations of instruments together thus producing a more peculiar “shallow” sound. For example, in one of the first party scenes the music is scored for bassoon and tuba duet with a sort of swing bass line underneath. This also gave the scene a comic touch. As far as musical style, I chose to write most of the music in a contemporary manner. That is to say I wrote the music to sound “modern day,” much like you’d hear from any current movie. 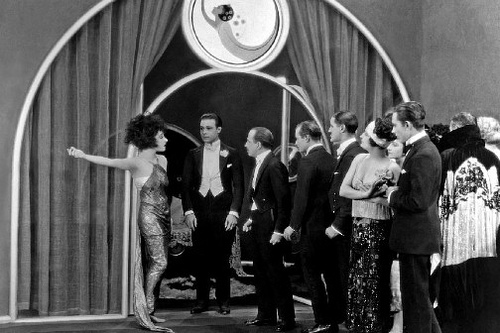 Even though this film version is set in the early twenties, at the very beginning of the film Alla Nazimova makes a point to include a title card that pondered on a “Camille of today.” Since the substance of this film version movie was set “in the current day”, I felt that a 1920s score wouldn’t work. Not only would it have put a lighter spin on the general mood of the film, but it would have also made it timely rather than timeless.